Former NASA astronaut Scott Kelly, who spent nearly a year on the International Space Station between 2015 and 2016, stands on the deck of the U.S.S. Intrepid, an aircraft carrier-turned museum in New York City, on May 26, 2016. Kelly received the Intrepid 21st-Century Pioneer Award from the museum. NEW YORK — Former astronaut Scott Kelly, who set the record for the longest sojourn in space for any American after his nearly yearlong mission ended in March, was honored at the Intrepid Museum's 25th annual Salute to Freedom gala Thursday (May 26). There, he received the Intrepid 21st-Century Pioneer Award. Kelly returned from the International Space Station's "Year-in-Space" mission on March 2. Since then, he has retired from NASA and continues to speak at events around the country. The Year-in-Space mission was designed to study the effects on humans of prolonged space travel. Kelly, along with Russian cosmonaut Mikhail Kornienko, spent a total of 340 consecutive days in orbit. 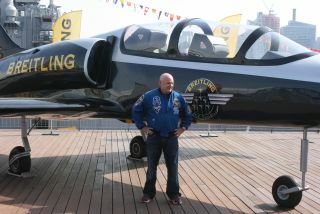 Former NASA astronaut Scott Kelly poses for a photo with the Breitling Jet Team on the deck of the Intrepid Sea, Air and Space Museum in New York City on May 26, 2016 during Fleet Week celebrations. Since returning, Kelly has spoken often of changes in his perspective after living in space for a year. He took the time to speak at Thursday's event, as well. "From orbit, it's clear that humans are polluting the planet on a significant scale," he told Space.com that morning. He noted that Earth's atmosphere is a thin layer on the planet itself, and you can see this very clearly from the space station. Even so, he said, he came away with a sense that humans can accomplish a lot. "I was really inspired by the space station, and how big it is," he said. "I felt like if we can do that, we can do almost anything." Researchers are using the data on Kelly's health in part to get a better idea of what would happen on longer trips to other planets, such as Mars. A Mars trip would require spending at least six months on a spacecraft to get there and six months to get back, plus however much time is spent on the surface. Beyond better understanding the health of the astronauts, Kelly said, there is still some technological development to do before such a trip. "Life support needs to be more reliable," he said. On the space station, it's possible to wait for a resupply of parts from Earth; a Mars mission wouldn't have that option. "If you're on your way to Mars and the toilet breaks, you're going to die because you run out of water." A Mars ship would also need much better radiation protection, he added. Another issue Kelly has faced is the transition from the microgravity conditions of the space station to full Earth gravity after the landing. Kelly said there are a variety of small physical ailments, enough that they might be significant after longer periods. Astronauts already have to exercise regularly to prevent loss of bone density. But there are other effects as well, such as disruptions to an astronaut's balance. "When you get back, your balance is off," he said. Initially, he felt the gravity, he said, and after about an hour he could walk normally. Getting used to the feel of gravity, though, took longer. "Sometimes it was hard getting out of bed." He said he felt some soreness as his joints got used to bearing weight again. While in space, one of the main things Kelly missed was fresh food, he said. Meals on the space station are akin to the prepackaged foods served to the military, though there have been efforts to improve it. Kelly also had a chance to eat lettuce grown in orbit. Many people wonder how differences among the crewmembers affect the mission, Kelly said, but that tends not to matter. "They filter a lot of that out in the selection process." Going back in to space isn't something Kelly's ruled out completely, though for now he is retired, he said. "I'm working on a book. That's enough for now," he said.